Donald Trump shocks Americans by telling them that he wants to make our nation “great again,” implying obviously that the United States had some greatness that is now lacking. It is easy to associate this clearly unpatriotic lack of faith in America with racism and xenophobia (implying, for example, that the US was great, until it went ahead and elected one of “those people” as its president for eight years). It is easy to do this because of Trump’s heartless criticism of Mexicans and Muslims (and of the latter’s faith, Islam). It is easy to do this because of the numerous Nazis, Klansmen, and fascists of all colors (so to speak) who have come out in open support for Trump. It is easy to do this because, notwithstanding the candidate’s willingness to tweet and speak about all sorts of people on the cuff and without any “due diligence,” it took him something like 48 hours to disavow one of America’s leading white supremacists. Attacking ethnic groups, dissidents, and women is not something the candidate needs to take any time to consider properly; but disavowing the country’s leading white supremacist was something that needed closer study, not being any kind of “no brainer” for our little Orangearschenfürher. All of this shows what most Americans need to know about what “greatness” is missing and how to restore it. But for those of us not raised from birth to hate “those people” or to misogynize at our morning Tea Party, it is clear that what we need is not for our nation to be “great again,” but for our country to be good again, like Sydney J. Harris suggests. We need to remember John Winthrop’s exhortations to us to build the City on a Hill by embracing the liberal imperative to care for the poor, to house the homeless, to feed the hungry, and moreover to use the wealth of those at the top for that explicit purpose. We need to remember that politics should be about caring for those needing medical care, not about politicizing issues. When we attack Planned Parenthood for performing a legal operation (and doing so using only private funds, and not anyone’s taxes), and use the government to punish the organization – and the many women and men it cares for in other ways, using both public and private funds for the purpose – for offending a minority of Americans, we are not “good,” and we are not the nation that Winthrop called upon us to be. When we attack people for not speaking English “properly” (ignoring the multitude of uneducated bigots who themselves have a limited grasp of our grammar and syntax, though it be their only language), we are not “good,” and we are not the nation that was built on the labor and the blood, sweat, and tears of immigrants, indentured servants, slaves, and refugees. Our parents, grandparents, or other ancestors (those that came here willingly, anyway) came to this nation not because of its military strength, and not because we pick on the weak and leave the dying to meet their end. They came here because we are a nation that has always promised to be better than that. They came here because we offered them something better than the empires of the past, great only for their ability to kill and to disenfranchise others. Coming to our shores for our “goodness,” rather than for our “greatness,” they built this nation – together with those who simply had no choice in the matter – into a nation that was able to grow past its dark side, and embrace the better angels of our nature. We became a nation born of slavery that (later than most) discarded slavery; a nation dominated by men who (later than some) embraced suffrage; and a nation dominated by white Christians who (through a mountainous struggle) embraced the “Others” and welcomed them into our community as builders and partners. Recently, I was reading some remarks from a former teacher who posted onto Diane Ravitch’s blog, and the teacher was lamenting about (among many other things) the failure of educators to teach the value of education, and of learning, in and of itself. This resonated with the words of Edith Hamilton, author of one of the most widely read books there is on European mythology. Is it good or bad that we attempt to get children motivated to learn by emphasizing how hard it will be to get a job in the 21st century without an advanced education? One the one hand, as poor as the education system is growing (and as miserly as our largely Republican-led school districts are about public education, and as powerful as corporate for-profit “education” is becoming in the place of public education), we need students to understand that they have to be proactive in learning, in taking their education seriously. Students need to orient their learning toward modern skill sets – computer skills, math and science, and foreign languages (especially those to become significant in the upcoming decades, like Chinese, Farsi, Arabic, Spanish, and Portuguese). But we cannot overvalue education as merely a meal-ticket. Anti-intellectualism has long been a powerful force in our country, and is one that in this new century must either be overcome finally, or will overcome our nation once and for all. Anti-intellectualism questions what value there is in education beyond what it can do to put food on your table; and fails to see the value in learning about culture, learning social sciences, and learning philosophy and aesthetics. We are entering a new century in which social media is predominant in shaping thoughts: the 140-character tweet in place of the twenty-page manifesto. The single line of response on Facebook to a two-phrase smarmy meme, as opposed to a full discussion on “20/20.” The Instagram replacing the fully-researched and vetted New York Times article. We are entering a world in which thinking is inconvenient and discouraged, particularly if its manifestation requires more than a sentence or two. Complicated thought, and a fuller understanding of whatever subjects we are entering, is becoming a lost art and in its vacuum we are building a new venue for populist politics. When pundits ask from whence this new Trump phenomenon comes, the answer is in part with this very problem. We applaud a simple and ill-spoken man for “speaking his mind,” as he uses quick and easily fact-checked distortions of reality to convince an entire audience untrained and unused to complicated thought, and unprepared to live in a complex, globalized, and multicultural world. The United States is losing the ability to train minds for the next century, and to transfer useful skills to the next generation. We are entering a new world, in which global relationships are becoming more complex, more decentralized, more culturally aware and diverse, and more technical, all at once. Engineering, languages, art and music, math and computer languages, and awareness of the climate effects of technology, are all going to be the main driving forces in determining who can compete in the next few decades; who can get the kind of job that supports a family, and who goes hungry and goes poor. We need to prepare students for the new century not just with technical (STEM, or science, technology, engineering, and mathematics) education, but with art, social science, languages, and cultural education. As we prepare students for the new century, realizing that most of the old jobs found by our parents to raise us are no longer going to be the drivers of the new economy, we must also train our children – all of them, and most especially the poor – to value education not merely as a step to a paycheck, but as a value in and of itself. We must teach the value of forming and arguing complicated thoughts; of reading complicated tracts; of considering arts and aesthetics beyond the things we may be exploiting for whatever work we seek. If our nation is going to make it in the more competitive environment of the new century, our children need to be able to use computers; but they also need to be able to understand other cultures, people born into different environments, and complicated relationships between the human species and the global environment. Our children need to understand art history and the concept of music. Our children need to understand the difference between rhetoric and argument. Our children need to understand the difference between verified fact and popular opinion. And they need to understand that “scientific theory” does not mean merely someone’s vague and subjective guess, but an established explanation that has passed the basic test of experimentation and validation, and is an accepted understanding of the phenomenon explained. They need job skills, and they need the ability to have a lengthy conversation in a coffee shop about Sartre. To teach skills needed not just by individuals, but by our nation as a whole, we need to generate an enthusiasm for learning that goes beyond the job description. We need to generate a population able to converse and compete with others globally, on subjects technical and aesthetic, objective and subjective. We need students who seek learning because it makes them better people, not because it makes them (briefly) more seemingly employable. Otherwise, we lose the strategic edge in competing globally, as greater human skill-sets are used to determine job security, as corporations move past simple requirements to greater social values (factors more easily implemented by human resources departments in an increasingly digitized and information-driven world). Once we lose that strategic edge, we will have lost our ability to compete and we will have lost the economic foundation that enables us to have a stable political environment. Once we lose that edge, our nation will plummet ever more quickly into populism, extremism, violence, and authoritarianism. We will seek, ever more, the safety promised by “strong leaders” who ask only that we surrender our freedoms. But we do not have to go down that road; and the alternative path begins with education, and with infusing into our children, and into our population as a whole, an enthusiasm for learning, for reading, for writing, and for thinking. We need, once again, to be caught up in a world of thought. Now that we are past Semi-Super Tuesday (March 15, that is; not its official designation, of course), it is time again to look ahead to the next round of the primaries, and to consider the greater context into which the primaries are playing out. First of all, if you are new to this process, and have not read Spark!‘s earlier posts on the subject, you can see all of our blogs on the primaries (three so far) by going to the Elections 2016 Category. We have covered thus far the process in general (in “Primer on the Primaries“); the “First Round of the Primaries” (covering the beginning of the primaries, up through Super Tuesday, March 1); and the “Second Round of the Primaries” (from late February, through March 15). The primaries will continue into June, and of course are intended to select delegates for both parties’ conventions in July (the Republicans in Cleveland, July 18-21; and the Democrats in Philadelphia, July 25-28). For the purpose of this blog, we are designating “Round Three” as taking us through the end of April. May and June will constitute at least “Round Four;” and possibly more if needed to cover events as we move forward. Marco Rubio: 169 delegates, and out. Before moving forward, we can see, then that both Democratic candidates still have a viable path to the nomination; but that Clinton’s path is a far easier one than is Sanders’s. On the Republican side, no candidate has yet a decisive edge for the first ballot in July. Trump is by far the closest; but he still needs a greater percentage of the remaining delegates than he has shown himself able to secure thus far. There is good news and bad news ahead for the Trump campaign. The good news for Trump (and the bad news for the GOP and for the rest of the nation) is that the “winner takes all” states have now started voting. In those states, Trump only needs to secure a plurality to get all of their delegates; and he has shown himself clearly able to accomplish that. The bad news for Trump (and the good news for the rest of us) is that the Republicans are becoming increasingly hostile to him, and may manage to pull out enough key victories in states where Trump is weak to keep him from achieving the delegates threshold for the first ballot at the convention. From there, things get a lot more interesting – and Trump may yet manage to secure a victory in Cleveland, so a brokered convention is not necessarily a Trump defeat. None of the other Republican candidates has a viable path to first-ballot nomination. Cruz needs an impossibly high percentage (over 76%) of the remaining delegates, and has nowhere been able to come anywhere close to such a victory, let alone achieving that nationally. He would basically have to win many major winner-takes-all states to achieve that. John Kasich, earning recently his first state victory in his home state of Ohio (a “winner takes all” state giving him the entire Ohio delegation), has so few delegates to his name that even if he were to win every single remaining delegate at this point – a 100% victory in every state, requiring nothing short of divine intervention – he would still come in 18 delegates short of a first-ballot win. Marco Rubio, of course, has suspended his campaign, although his ghost may resurrect at the convention for second or subsequent ballots. Thursday, March 10: Virgin Islands (R). The caucus has already taken place; but no results have been announced yet. 9 Republican delegates will be apportioned, on a winner-takes-all basis. Tuesday, March 22: Arizona and Utah will both hold dual-party events (primaries in AZ, and caucuses in UT). The Republicans in American Samoa will hold an open convention; and the Democrats in Idaho will caucus. Arizona is a winner-takes-all state for the Republicans. Polls on Tuesday (March 15) showed Trump leading Cruz, 31% to 19%; but there were also 30% undecided respondents among the Republicans. Clinton had a decisive edge on Sanders, 50% to 24; but that also puts 26% of Arizona Democrats into the undecided category and up for play. Arizona could be a huge Clinton win; or a marginal Sanders victory. Arizona has 58 Republican delegates to offer; and 75 Democratic delegates (plus ten super-delegates). Utah has not been polled recently; but back in February both Cruz and Rubio had slight edges over Trump. Bush, Carson, and Fiorina were still in play back then; and while Bush voters are unlikely to reach for Trump, Carson voters are more likely. With Rubio gone, it may be easy to suggest that his voters support Cruz; but the two are widely different species of the Republican order, and Rubio supporters may go for Kasich or even Trump instead. Some 42% of February’s respondents supported candidates no longer running; and so Utah has the chance to offer some nasty surprises. February polls also showed Clinton leading Sanders 50% to 44 (with Sanders up a few points from January); and Sanders’s viability may well have been strengthened by his recent performance, so Utah is going to be a big fight for the Democrats as well. Utah has 40 Republican delegates, 33 Democratic delegates, and 4 Democratic super-delegates. Idaho’s caucus is currently presumed to be a modest Sanders win, giving both candidates roughly half of its 23 delegates. Idaho and the other primaries and caucuses that day will give the Republican candidates a total of 107 more delegates; and the Democrats a total of 131 more, not including 18 super-delegates. Saturday, March 26: Democratic caucuses in Alaska, Hawaii, and Washington state. Polling on these states is meager at best, and not up to date. Together, they will allot to the candidates some 142 delegates, and 30 super-delegates. April 1-3: Republican state convention in North Dakota, which will nominate delegates to the July convention in Cleveland. 28 Republican delegates will ultimately be sent to Cleveland from North Dakota. Tuesday, April 5: Wisconsin open primary for both parties. Wisconsin has no recent polling, but Trump held a significant advantage in February, when the field had more players. Although the “middle states” have been forming a strong Cruz bastion, it seems unlikely that Trump’s advantage will have lessened; and it is a winner-takes-all state offering Trump (or whichever Republican wins it) all of its 42 delegates. On the blue side, Clinton and Sanders were running neck and neck at the beginning of the year; so its 86 Democratic delegates make it a significant battleground state. Saturday, April 9: Wyoming‘s Democratic caucus for its 14 delegates. Following this caucus, from April 14 through the 16th, Wyoming Republicans will hold a state convention to select the 15 remaining delegates selected by the party (there was a caucus on March 12; but it only had 11 delegates selected by that process). Three more Republican delegates from the state are super-delegates, as every Republican state party is allotted three such slots. Polling data on Wyoming is lacking; but Ted Cruz blasted Rubio and Trump out of the water there last Saturday, taking 9 of the 11 selected delegates. Tuesday, April 19: New York‘s closed primary for both parties. The most recent polls showed Clinton with a whopping advantage (71% to Sanders’s 23) for its massive allotment of 247 Democratic delegates; however previous polls showed far less of an advantage (55% to 34 at the end of February), so either the recent Emerson poll is skewed, or Clinton’s success on March 12 has helped to shift New York more substantially in her favor. Trump has a similar advantage there by the same polling firm (64% to Cruz’s 12; Kasich has a mere 1%), but previous polls by other firms had his numbers in the mid-40s. The Republican party allots New York’s delegates as “winner takes most”; so as long as he has the plurality, he gets the bulk of delegates, but Cruz could still come out with delegates. The trick to New York, however, is that it also has a 20% inclusion threshold; only candidates gaining at least 20% of district votes get any delegates from them. Neither Cruz nor Kasich have been approaching those numbers in New York, so it is looking like an almost automatic Trump victory. Cruz will likely rue the day he criticized “New York values” on April 19. Tuesday, April 26: “Mini-mini-Super Tuesday” (I presume that only I am calling it that). Connecticut, Delaware, Maryland, Pennsylvania, and Rhode Island will all hold dual-party closed primaries, a huge battle for the Old Colonies. Some 172 Republican delegates and 384 Democratic delegates are up for grabs. While there is useful polling data for Maryland and Pennsylvania, the other three states have not been adequately polled since November, 2015 (when almost all of the original 17 Republican candidates were still running). A lot of voters have shifted to Sanders from Democratic undecided respondents since then, so only relatively recent polls are useful. However, the entire region has been continually found to be more favorable to Trump than to other Republicans; and is largely more favorable to Clinton. Delaware and Maryland have winner-takes-all Republican primaries; and Connecticut has (like New York) a 20% inclusion threshold as well as a 50% winner-takes-all threshold, so it may be a full Trump victory as well. Total delegates, Round Three: 444 Republicans; and 1,004 Democrats (plus 184 super-delegates to be decided separately). Hillary Clinton will gain another 520 delegates, giving her 2,134. At that point, Clinton will need only 18.3% of the remaining uncommitted delegates to win the nomination. Bernie Sanders will gain 417 delegates, giving him 1,273. He would then need 82% of the remaining uncommitted delegates to win the nomination. If our projections come anywhere close to the events, then by the end of Round Three, while Sanders will have come even closer to Clinton’s numbers, Clinton will have achieved enough superiority to take the nomination at the first ballot of the convention with ease. In the meantime, Donald Trump will gain another 346 delegates, for a total of 1,019. He would need to get 34.1% of the remaining delegates to win the first ballot in July. Ted Cruz will gain 71 delegates, bringing his total to 484. He would need more additional delegates than are available; and therefore could not get a first-ballot nomination. John Kasich will get another 18 delegates, bringing him up to 161. He already has no chance for a first-ballot nomination. The key states to watch during this process are Arizona (for both parties), Washington (for the Democrats), Wisconsin (for both parties), and New York (for both parties). Collectively, the statistically uninformative Old Colonies battling it out on April 26 will also host a major contest for substantial delegates and for new numbers. Thomas Paine’s words give us a lens with which to look at two diverging routes taken by American political forces. On the one hand, we have the conservative low road, sinking our nation to its lowest depths of racism, xenophobia, and bigotry, taking us ever further away from our shining City on a Hill and the establishment of a liberal community of prosperity and care. On the other, we have the liberal high road to the City, to using our wealth (as leading Americans since John Winthrop in the 1630s have urged us) to care for the poor, sick, and unemployed. Paine informs us that while the low road allows us to apply our Constitution and other national principles only minimally, and only for established American citizens, the high road to the City requires a liberal application of constitutionality to all human beings, regardless of national status. We have too long allowed our government (even under President Obama’s moderate hand) to traverse the conservative low road. We have allowed our government to imprison, without charge and without any intention to prosecute, foreign nationals for an unlimited duration. We have allowed our government to encourage other governments to torture and to evade American principles of legality and morality through machinations like extraordinary rendition. We have allowed our government to target American citizens believed to be aiding foreign hostile forces, without providing the required basic constitutional protections to those citizens. So it should come as no surprise when our government wants ever more invasive tools of espionage and oppression, as indicated by the latest court battle with Apple over cell-phone encryption. It is no surprise that, allowing our government to forget our constitutional principles (and allowing the government to limit constitutional protections to established US citizens – and not even all of those), we now have an entire Republican party hostile to foreigners – immigrants and refugees, the very types of people who (together with slaves) built this country in the first place. It is no surprise that a Republican candidate is having audiences replicate the Nazi salute as they swear allegiance to their Orangearschlochführer and as they loudly urge him to protect them from Mexicans and Muslims. This is where the low road is taking us – away from our City on the Hill, and toward an ideological parking lot; empty, barren, and open for sale. Instead, Paine urges us to take the high road. Paine pushes us to build Winthrop’s City, a liberal community of care and ethics, and of prosperity and wealth. Paine urges us to apply our Constitution to all human beings, not just established US citizens. Paine urges our politicians to treasure all citizens – not just those supporting them at rallies (and unlike those like Trump openly mocking anyone not buying the cheap dime-store make-up job he wants to put on our national legacy and principles). Paine urges us to remember that when foreign nationals at Guantanamo are denied constitutional protections, we are building precedents for our government to weaken and remove our protections here at home. Paine urges America to remember its revolutionary principles. Those principles can only truly shape our polity at home and the rest of the world abroad when we apply them as liberally as we can. We must guarantee basic constitutional protections to all people, and not ask first where they were born, what language they speak, what faith they profess, or what citizenship they hold. The Republicans, and extremist forces like Trump, will continue to take the low road away from our City on a Hill, and strive to tear our City down in favor of a parking lot. We Americans must fight them at every step, and drive forward on the high road, to the City, to a greater community of care and wealth and social justice. Else we establish a precedent that truly denies protection not just to some loosely defined “outsider,” but to our ideals, to our communities, and to ourselves. 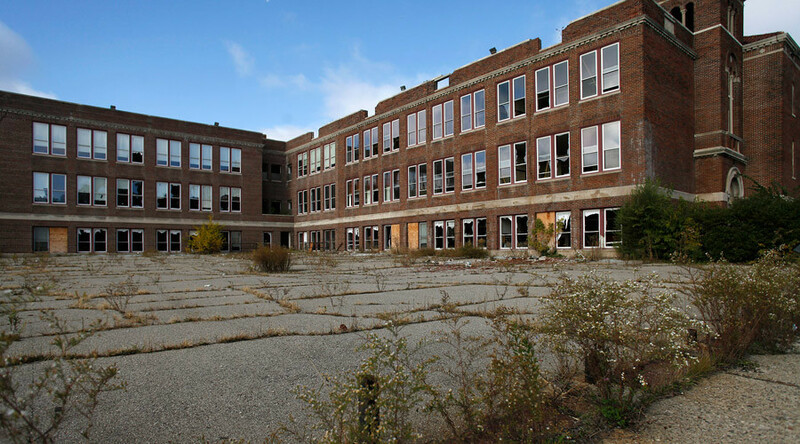 The one-time chairman of GM (and president of Ford before that) would certainly be appalled to discover the condition of the Detroit Public Schools today, the very opposite of the high pedestal upon which he preferred education to be hoisted. With teacher “sick-outs,” and protests against Governor Snyder’s emergency management controls over DPS, and with schools closed and budgets out of money, the conservative approach toward privatizing and profiteering our education system (and a financial “bottom-line” focus rather than a student-centered approach) has wrecked our communities, and the prospects of our next generation. Instead of being able to compete globally with children educated for the 21st century, Detroit school-children under the Republicans’ oversight are almost entirely doomed to lives of dependence, poverty, and crime. When Republicans claim to represent “family values,” they are hard pressed to explain how policies which damn entire families to perpetual poverty and servitude support modern American families. “Family values” should focus on the long-term sustainability of the family as a unit, including most importantly the economic prospects of the children. Republicans merely use the term “family values,” however, to promote the interests of those at the top (and, of course, the racial composition of the elite) against potential competitors from the middle and bottom. Therefore, in the Republican view, teachers should not get the best pay and our schools should not be revered as temples of learning. Instead, teachers are “eating off the public dole.” Schools are merely used as areas to test a new permissiveness in gun rights, and as opportunities for the corporations supporting Republican candidates to run for-profit, low-achieving charter schools. There is a simple solution to this problem; but that solution has been available and avoided for years, especially in the state of Michigan. It can be done, but it is difficult; and our citizens have long avoided implementing it. That solution is a return to the City on a Hill, the building of a community of care and welfare, based on the financial strength of our wealthy (and a tax basis determined to use that wealth for the public good, as argued by John Winthrop in his sermon on the nature of a Christian nation in the 1630s). That solution must be implemented either by the Democrats or by more progressive parties, as the Republicans are increasingly hostile to the formation of Winthrop’s vision of a Christian nation, of a City on a Hill, and of a community working together. That solution requires liberals and progressives to vote, often and always; and to participate in the political process constantly (through letter/email writing, calls to officials, and self-education on issues and candidates). That solution requires work, and an admission of individual responsibility for our community (something more than a “hobby,” more than an “interest in politics,” but an obligation of citizenship in a democratic society). We can build Iacocca’s pedestal for education; but only if we choose to work for it. Headline image: “Colin Powell Academy in Detroit, Michigan, one of the many schools abandoned since 2009.” Caption from rt.com; photo © Joshua Lott / Reuters.